The premise of Anna In-Between is simple: Anna Sinclair, a thirty-nine-year-old editor at a big book publishing company in New York City returns to the (unnamed) Caribbean nation where she was born and raised in order to visit her parents, Beatrice and John Sinclair. While there, she learns her mother has advanced breast cancer, but refuses to go to the United States, which has better hospitals and equipment, for the operation that could save her life. Far from being melodramatic, Nunez's straightforward prose and subtle characterizations give the story a sense of truth. Anna has always felt she is not good enough for her mother. Her failed marriage is a bone of contention between the two women—as is Beatrice's lack of physical affection towards her daughter—and her feeling that she is now an outsider in the land of her birth is a recurring motif. Afraid of disappointing her mother, Anna allows her to believe she is an editor at the large publishing company, Windsor, rather than at the small Windsor imprint, Equiano, which prints “urban lit” by and primarily for people of color. We get a glimpse of Anna's struggle with the ghettoization of her authors into racial categories and her efforts to promote serious works by authors of color to a wider audience. 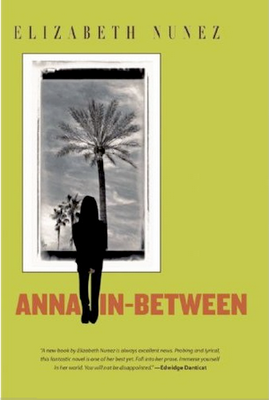 In addition to exploring the complicated relationships between an adult child and her parents, Anna In-Between touches on issues of colonialism and collaboration. Anna's father became one of the top men at the British-run state oil company shortly before England granted the island independence. He is seen as a traitor by some, but explains his decisions towards the workers with dignity. We also see how his new job affected his wife and young daughter as they moved away from the neighborhood and people they knew, but were not accepted in their new surroundings, providing an incisive depiction of intersecting class and racial prejudices. The Sinclairs' domestic help—Singh the gardener and Lydia the maid—are well-drawn, compassionate portraits. Anna feels that her mother talks down to them, but they protest that they are used to her mother's sometimes harsh tone. With Lydia, in particular, we see how despite her outward appearance of strictness and conformity Beatrice truly cares for her maid, going out of her way to protect her from an abusive ex-husband and providing school uniforms for her grandchildren. The message is clear: even the people we have known the longest may surprise us. Beatrice's illness allows for an intimacy between mother and daughter that is much closer than they've experienced before and the two reveal aspects of their lives that were previously hidden. Nunez does not give these revelations too much weight; she allows them to shift the characters' feelings and viewpoints to a degree, but not to cause a complete seismic shift in the relationships. And not all of Anna's problems—her relationship with her mother or her struggle to better advocate for her authors— are solved in 347 pages. Nunez has written a contemplative and absorbing examination of a woman standing in two worlds: the land of her birth and the country she now inhabits. While I felt I gained a new perspective on life in the Caribbean, the well-drawn characters are what ultimately make this story resonate.